Antibiotics are a group of medicines that are used to treat infections caused by bacteria and certain parasites. They do not work against infections that are caused by viruses – for example, the common cold or flu. Antibiotics are normally only prescribed for more serious bacterial infections – for example, pneumonia. When prescribed, it is important to take the entire course of antibiotics which helps to prevent resistance developing to that antibiotic. Most side-effects of antibiotics are not serious – for example, diarrhoea, or mild stomach upset such as nausea. Although some people develop a serious allergy to some antibiotics, this is rare. An antibiotic (or antibacterial) is something that kills bacteria or slows the growth of bacteria. They are often medicines used to cure diseases. Antibiotics do not harm people. Penicillin is a popular antibiotic. Antibiotics started to be produced in 1939. 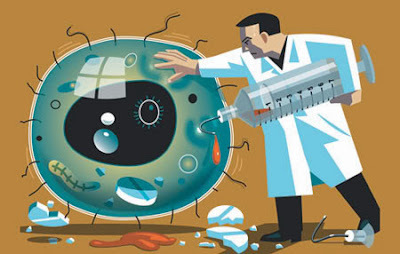 Antibiotics cannot stop a virus. Antibiotics are not the same thing as antibodies.